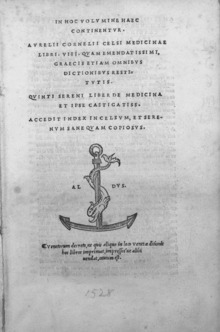 De Medicina is a 1st-century medical treatise by Aulus Cornelius Celsus, a Roman encyclopedist and possibly (but not likely) a practicing physician. It is the only surviving section of a much larger encyclopedia; only small parts still survive from sections on agriculture, military science, oratory, jurisprudence and philosophy. De Medicina draws upon knowledge from ancient Greek works, and is considered the best surviving treatise on Alexandrian medicine. Its "encyclopedic arrangement follows the tripartite division of medicine at the time as established by Hippocrates and Asclepiades — diet, pharmacology, and surgery." This work also covers the topics of disease and therapy. Sections detail the removal of missile weapons, stopping bleeding, preventing inflammation, diagnosis of internal maladies, removal of kidney stones, the amputation of limbs and so forth. He classified mental disorders into: Phrenitis, delirium with fever; Melancholia, depression; one due to false images and disordered judgment, presumably schizophrenia; Delirium due to fear; Lethargus, coma; and Morbus comitialis, epilepsy. The term insania, insanity, was first used by him. The methods of treatment included bleeding, frightening the patient, emetics, enemas, total darkness, and decoctions of poppy or henbane, and pleasant ones such as music therapy, travel, sport, reading aloud, and massage. He was aware of the importance of the doctor-patient relationship. De Medicina was known during the Middle Ages up to the 9th or 10th centuries, but was later lost up until the 15th century. It was the first medical book to be printed, in Florence, 1478. ^ Thayer, Bill (2005-03-19). "Introduction, Celsus, On Medicine". Penelope. Retrieved 2008-07-21. ^ a b Simmons, John Galbraith (2002). Doctors and Discoveries: Lives that Created. Houghton Mifflin Reference Books. ISBN 0-618-15276-8. ^ a b Prioreschi, Plinio (1996). A History of Medicine. Horatius Press. ISBN 1-888456-03-5. ^ "On Medicine - De medicina". World Digital Library. Retrieved 2014-03-01. ^ Southern, Pat (2007). The Roman Army: A Social and Institutional History. Oxford University Press US. ISBN 0-19-532878-7. ^ Howells, John G.; Osborn, M. Livia (1984). A reference companion to the history of abnormal psychology. Greenwood Press. ISBN 9780313242618. Retrieved 21 April 2013. ^ Langslow, D. R. (2000). Medical Latin in the Roman Empire. Oxford University Press. ISBN 0-19-815279-5. "De medicina". World Digital Library (in Latin). Retrieved 2014-03-01.